Over 100 players participated in this year’s Phoenix Adult and Senior Open held at Scottsdale Ranch Park. Play started on Friday night Oct. 5 and concluded late afternoon Oct. 7th. Many players participated in multiple events, so there was plenty of tennis action this weekend. 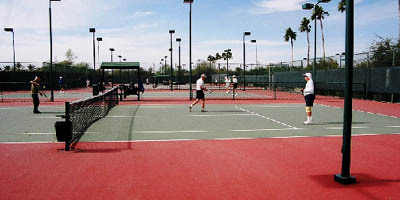 The Phoenix open is one of the premiere adult tennis tournaments in the valley and is a significant fundraiser for the USTA Central Arizona. USTA Central Arizona uses the proceeds from the tournament to give back to the Phoenix tennis community by: supporting Adult leagues, After-Schools Tennis, Jr. Team Tennis, Facility Support, Jr. and Adult tournaments and so much more. The host venue for this year’s 2012 Phoenix Adult and Senior Open was Scottsdale Ranch Park. A special thanks goes out to Scottsdale Ranch Park for allowing us to use their courts. We appreciate your continued support of USTA! 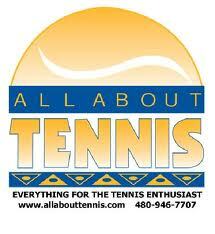 We would like to thank Jesse & Pam from All About Tennis for sponsoring this event. They provided the wonderful trophies, t-shirts, snacks, refreshment vouchers, and ran the tournament desk. Thank you All About Tennis for your generous contributions and volunteering your time.